Flying Finn Tapio Laukannen drove like a man possessed to clinch his maiden KCB Nanyuki Rally title in dry and dusty conditions around Lengetia and Loldaiga private ranches on Saturday. The former Finland and British rally champion, still fresh from his Wundanyi Rally win last month led the Nanyuki Rally Group-organised round from start to finish and candidly admitted he is going flat out for the championship which eluded him last season. Laukannen's fast and furious antics in Laikipia county treated rally spectators to some exhilarating displays much to the chagrin of local top guns who admitted that the Flying Finn was not only a rocket but a hard nut to crack. Second overall was defending champion Jaspreet Chatthe who trailed Laukannen by 2.09minutes. Carl 'Flash' Tundo despite struggling with reliability gremlins on his second outing in his Ford Fiesta Proto sealed the podium dash 5.51 minutes behind the winner. After five rounds, Laukannen leads the KNRC with 104 points with Chatthe who is also the African Rally champion second on 100 points. Fourth overall were the Kabras Sugar Racing team crew of Onkar Rai and Gareth Dawe in a Mitsubishi Lancer Evolution X. Onkar beat teammate Baldev Chager by a mere eight seconds. Rajbir Rai became the first top gun to kiss the event goodbye after he was time barred upon arrival at Batian service. Laukannen was all smiles and said: "All was good except for the fifth stage where we had problems with the front diff. We are not pushing at full potential at the moment but I'm glad to carry our championship lead into the remaining g three events. It will however depend on how Chatthe will perform so I have to keep handing on there, no matter what." Chatthe's navigator Gugu Panesar was happy with finishing second. He stated: "We had a good rhythm today and kept it clean on the sections. This was a very technical rally and I guess that the championship is still wide open with three events left." 'Flash' Tundo had to contend with lots of problems. "We had lots of little problems throughout the rally with the brakes ceasing at some point. But the whole plan is to sort out these problems and learn how to drive it (Ford Fiesta Proto). Tapio has shown amazing pace and should win the championship this season." Tundo said. Baldev Chager came in fifth and admitted. "We took it easy in the first run of Loldaiga but got a flat in the second run which we drove on it. I must admit that Tapio is out of this world and really appreciate the fact that he keeps improving the level of competition here in Kenya," Chager offered. 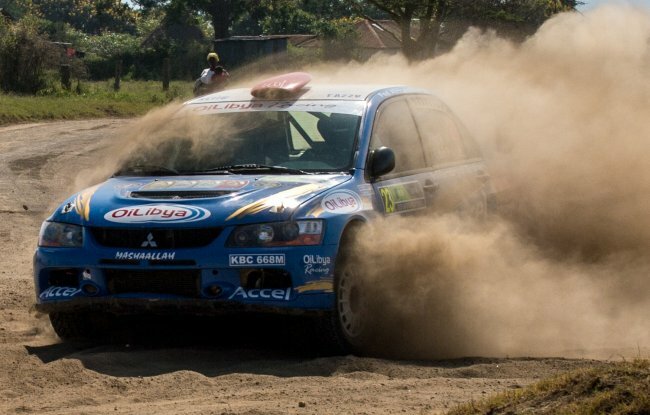 The fifth around of the Kenya National Rally Championship saw some drivers fail to master the Mount Kenya terrain. Eric Njogu, McRae Kimathi, David Kioni, Raaji Bharij were among the casualties. It was a bitter pill for Rajbir to swallow considering that he was lying third on the log at the halfway stage in Wundanyi. "We started off really well in the morning and five kilometers into the first stage got some tight twistings which saw us hit a tree stump then broke the steering arm which then pulled out the drive shaft and it took quite a bit of time to put everything back up so we ended up being time barred,'" said Rajbir's navigator Tim Challen. Out of the 35 drivers who started the event only 22 survived the demanding conditions. 1. Tapio Laukkanen/Passi Torma (Subaru) 1:39.17, 2. Jassi Chatthe/Gugu Panesar (EVOX) 1:41.26, 3. Carl Tundo/Tim Jessop (EVOX) 1:45.08, 4. Onkar Singh Rai/Gareth Dawe (EVOX)1:45.32, 5. Baldev Baldev Singh Chager/ Ravi Soni (EVOX) 1:45.40, 6. Ian Duncan/Amaar Slatch (EVOX) 1.45.43, 7. Manvir Baryan/Drew Sturrock (Ford Fiesta R5) 1:46.02, 8. Amaanraj Singh Rai/Tauseef Khan (EVOX) 1:53.08, 9. Tejveer Rai/Zahir Shah (EVOX) 1:54.47, 10. Jasmeet Chana/Ravi Chana (EVOX) 1:56.36, 11. John Nganga/Anthony Njenga (Subaru) 1:56.59, 12. Steven Mwangi/Jonathan Kosgey (Subaru) 1:58.23, 13. Mahesh Halai/Ketan Halai (Subaru N12) 1:58.33, 14. Dennis Mwenda/Job Njiru (EVO9) 1:58.49, 15. Jansher Sandhu/James Mwangi (EVO9) 2:03.01, 16. Asad Khan/Harshik Limbani (Subaru) 2:04.01, 17. Eric Bengi/Tuta Mionki(Toyota RunX) 2:06.12, 18. Tash Tundo/Chantal Louise Young (Subaru N10) 2:06.35, 19. Osman Abdullahi/Evans Mwenda (Subaru N10) 2:07.22, 20. Sammy Nyorri/Mwangi Kioni (Toyota RunX) 2:10.26, 21. Alex Lairang'i/ Tony Gichohi(Toyota Sprinter) 2:15.58, 22. Josiah Kariuki/John Ngugi (Subaru) 2:19.00.